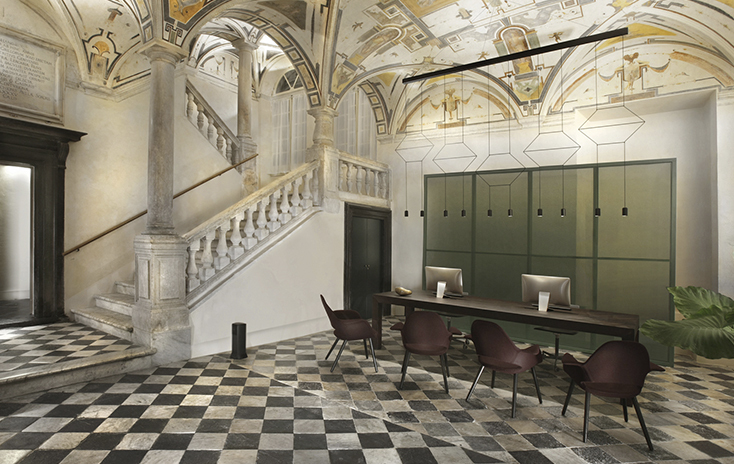 The Hotel Palazzo Grillo located in the Old City of Genoa, Italy is a UNESCO heritage site that evokes the Genoese appreciation of art, architecture and culture. Originally constructed in 1545 by Domenico Grillo the building suffered serious neglect over the centuries but has now been completely restored under the auspices of Le Nuvole group to become a luxury hotel offering guests a comfortable and contemporary experience. The 25 room hotel which opens to the public in April this year includes a selection of contemporary lamps that provide the perfect compliment to the different spaces within the historical building. From the Wireflow Lineal designed by Arik Levy that greets visitors over the reception desk, its cool sculptural and practical illumination set the tone for a sophisticated marriage of the old and the new. Guest rooms have been provided with a combination of the I.cono lamps, designed by Lievore Altherr Molina for task lighting and the floor version of the Warm collection by Ramos and Bassols for general lighting. The hotel library and common areas feature the North lamp designed by Arik Levy, its separation of shade, rod and counter-weight provides a foil to the tall ceilings and original frescoes painted by Bergamasco. While the Skan lights also designed by Lievore Altherr Molina, used to light the attic dining area reflect the elegance of a rediscovered space that provides views over the bell towers of Genoa’s historical centre.